DON’T Write in INK On the Walls! Today I was prepping a room in a home in Kingwood (far northeast Houston) that was damaged during the flooding from Hurricane Harvey in 2017. Look at what some contractor did – he went and wrote on the wall in INK! Most EVERY workman of any type knows that you NEVER write on walls with ink – nor crayon, Sharpie, lipstick, or other. Reason being, that these substances will work their way through wallpaper (and paint, joint compound, and other substances, too). It may happen quickly, or it may take a few years, but these materials will show themselves eventually, as ghost-like stains on the wall. Other things will cause staining, too, like blood, water, rust, oil, grease, food, wood sap (knot holes), and more. Luckily, there are dependable stain blockers on the market that can be brushed on. I like oil-based KILZ Original, but shellac-based BIN is good, too. Water-based products don’t perform as well, no matter what the label or salesman says. I like to be extra sure, so, when I can, as in this case, I will take a knife and cut around the stain, then dig into the drywall and remove the top layer, taking the ink with it. This way it is GONE, not just covered up. Of course, the remaining exposed / torn drywall needs to be sealed, skimmed over, sanded smooth, and then prepped for paint or wallpaper. But all that is worth it, when you can be assured that no stains will bleed through the finish coat. 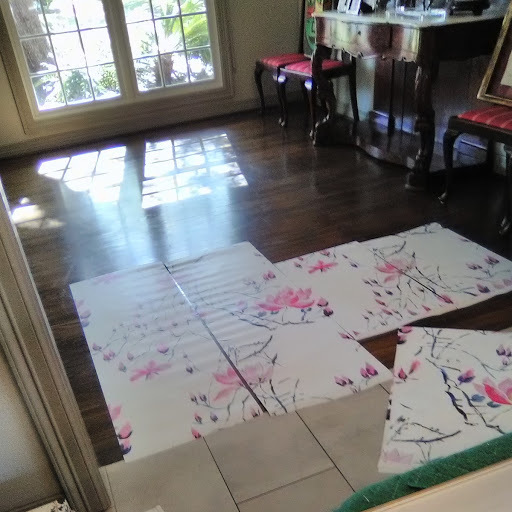 Before putting up a mural, I like to spread the strips out on the floor, to get an idea of the pattern, the layout, dimensions, etc., and to be sure the sequence is correct. Little did I know that the homeowner had recently oiled her furniture, and drops of oil had gotten onto the floor. The oil got onto the wallpaper and created several permanent stains. Whoops! Luckily, only one strip was effected. It was the end piece (far right of the mural) and was not needed. Whew! 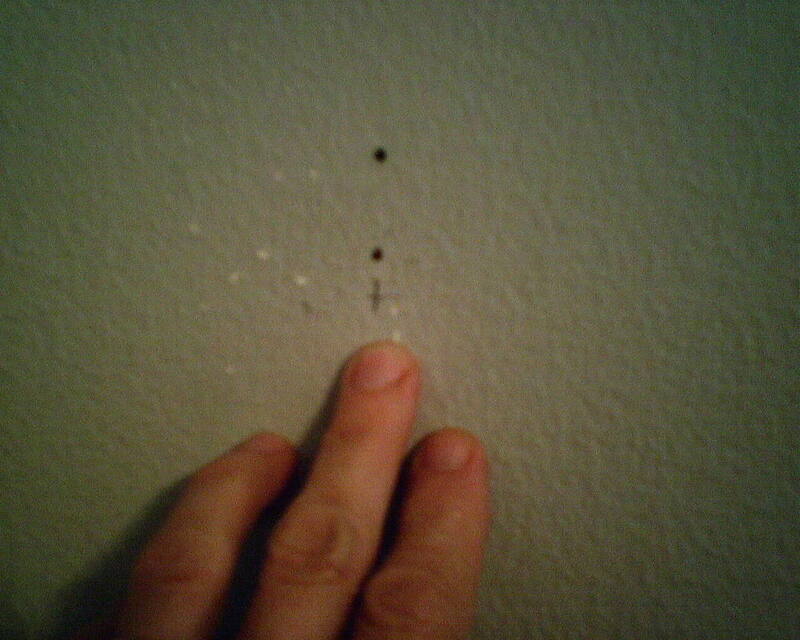 The two holes in the wall are from picture hooks. See the little “X” under the holes? That’s from whoever was hanging the hooks. He was measuring and marking the wall, so he would know where to hammer in the nails for the hooks. The only problem is that he used a ball point ink pen to make his marks. 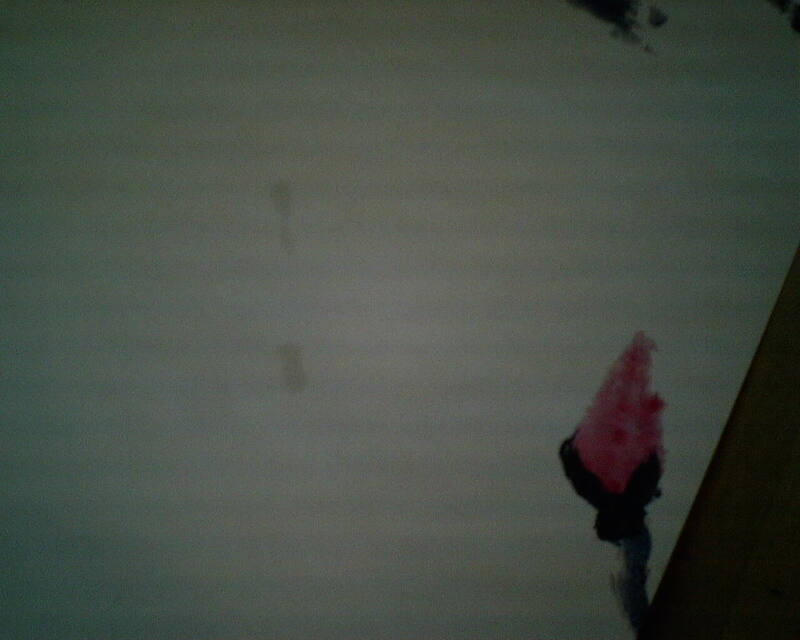 Ink is bad because, diminutive as this “X” is, it will bleed through wallpaper. It will bleed through paint and other materials, too. Other substances that can bleed through wallpaper include water stains, oil, grease, wax (crayon), tar / tobacco, blood, rust, and more. There are special stain-blocking sealers that can be used to cover these types of marks. KILZ Original is one that I like, and BIN is another. Since this was tiny, and since I was skim-floating the wall to smooth it anyway, I just used a putty knife to dig the mark out of the wall. Gone! That way I don’t have to worry if a stain blocker will do its job sufficiently. Then I skimmed over the gouge with joint compound to smooth the surface. See that red vertical line just to the right of the paint can? The previous wallpaper installer had used a red Magic Marker to color the edges of his vinyl wallpaper. This is a good way to cover the white edges so the seams don’t show, especially with a dark paper. But it’s better to use chalk or colored pencils, because oil or ink can bleed through and will stain the new wallpaper or paint. In this photo, the previous dark red wallpaper has been stripped off, but the red ink that was used to color the seam’s edges has soaked into the wall. The wall has been skim-floated with a light coat joint compound and then primed with the penetrating sealer Gardz. Yet the red ink has bled through. If wallpaper is hung over this red line, it is quite likely that, over time, the ink will work its way through the various layers and up to the surface. The best way to prevent that is to use a stain-blocker. KILZ Original oil-based sealer and stain blocker is about the best product on the market for this. Brush it on, it dries quickly, and then you are safe to apply wallpaper, paint, or other materials. KILZ will also block stains from oil, smoke, rust, water, ink, crayon, tobacco, and more. The dark red stain on the edge of that outside corner is rust. It is coming from the metal bead used to define the corner when the house was built. The only problem is, in a steamy bathroom with poor ventilation, these metal beads are sometimes prone to rust. And rust bleeds through wallpaper. Before I started hanging the new, pastel-colored wallpaper, I had to block off the rust stains. Nothing tackles this job better than the original oil-based KILZ Original. I’ve taken a small brush and applied KILZ to a half-inch wide strip that runs the height of the wall. It dries in about an hour, so paper can be hung fairly quickly. 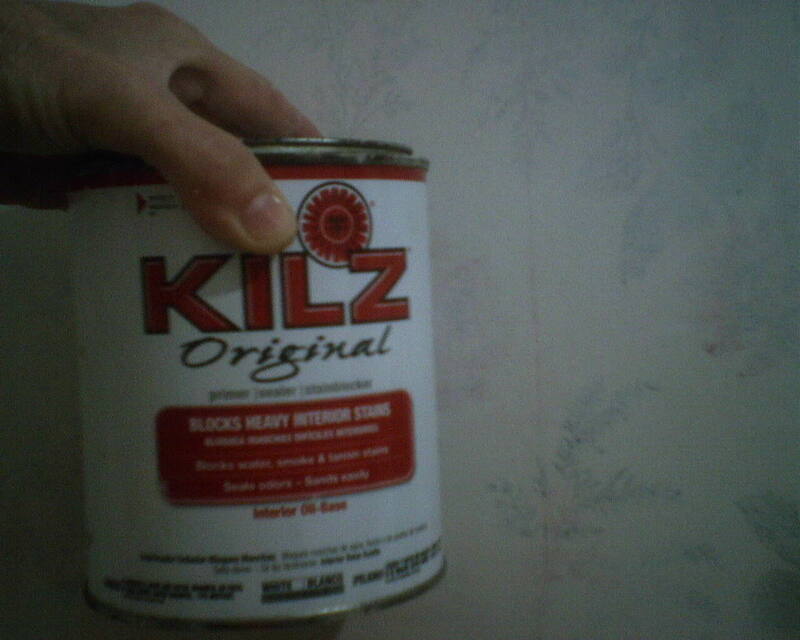 Other substances can stain wallpaper, so KILZ is good to have on hand. 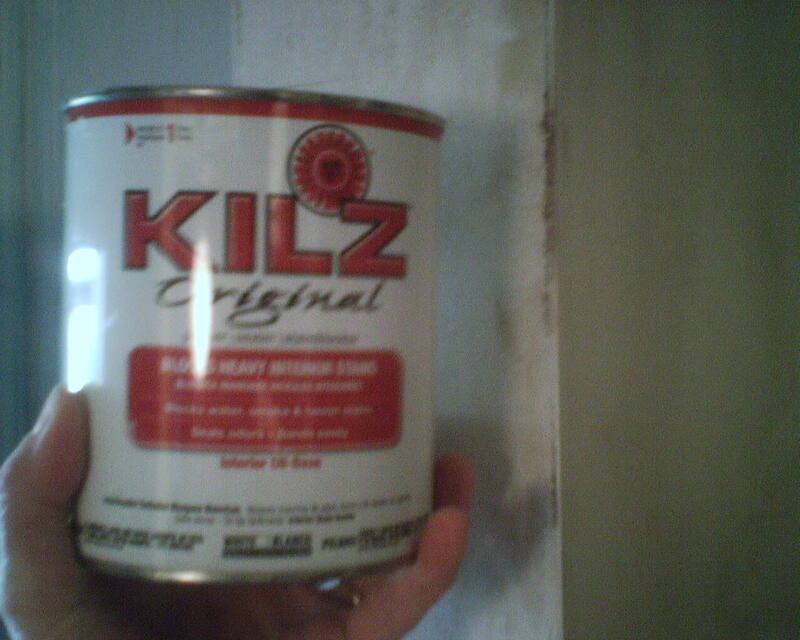 KILZ also seals off water stains, oil and tar, ink and markers, and odors, like smoke from cigarettes or fire. This powder room was originally painted a very dark brown. The new homeowner had her painters cover it with a good quality sealer and stain blocker, oil-based KILZ Original. This makes a good wallpaper primer, too. So I didn’t need to do any prep, but could just start hanging wallpaper. 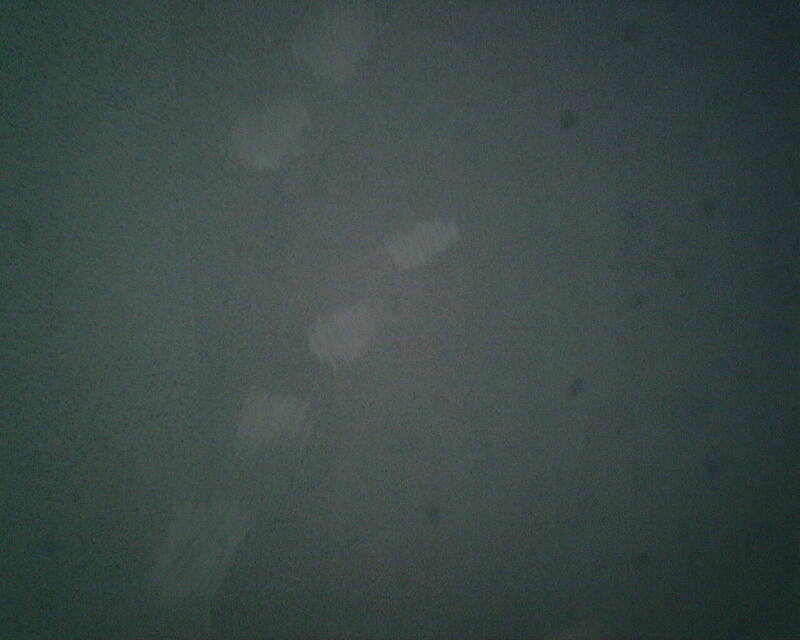 But when I looked at the walls, I noticed some light dots all over one area. It looked to me like possibly something bleeding through – as if oil or mold or something had gotten onto the wall. This is a problem, because these substances can bleed through wallpaper and stain the surface. 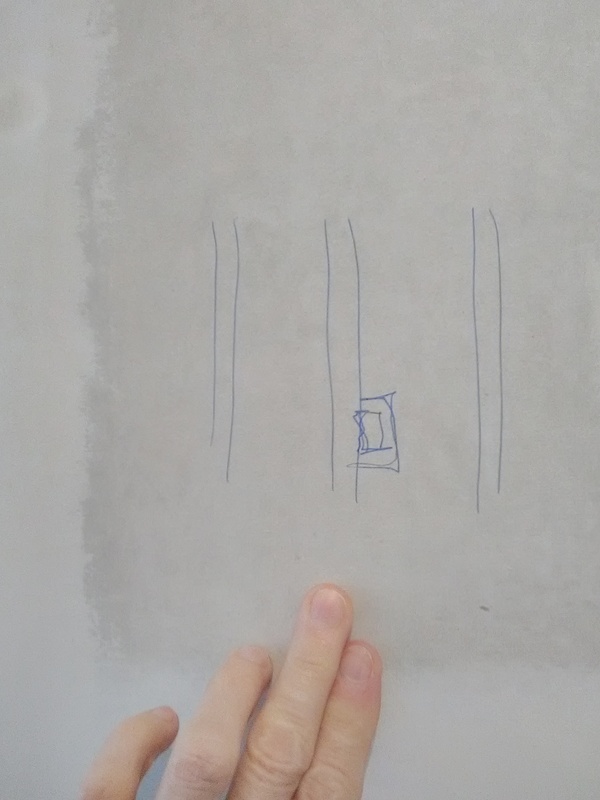 Or – the dots could have simply been because the painter had a lump stuck to his roller, and it was leaving this pattern with each rotation of the roller. But you never know, and I didn’t want to risk having something stain the new wallpaper. Even though I had been told that the room had been painted with KILZ, and I know that that product seals off stains and prevents bleed-through, I wanted to be extra sure. So I got my “emergency” quart of KILZ out of my van and daubed more on, on top of each of those little dots. In the photo, you see some dots, and some daubs of KILZ.